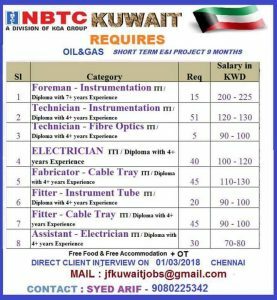 nbtc kuwait jobs 2018 : NBTC KUWAIT INTERVIEWS NEWPLACEMENTS. CLIENT INTERVIEWS ON this month 2017.HUGE MECHANICAL MAN POWER NEW PLACEMENT. SEND YOUR CV FOR INTERVIEW SHORTLISTING.FOR MORE INFORMATION CONTACT THE GIVEN NO IN THE LINK. I am looking job for safety engineer over 15 years experience with NEBOSH IGC certificate, OSHA and IOSH. I am finding jobs as a Entry level electronics engineer . If there any vaccancy means please forward it . i have done my graduation in mechanical engineering looking for a job in kuwait, had experiance in governing system of steam turbines. Iam flexible at field work wherever in kuwait. qualification: MBA finance and marketing. 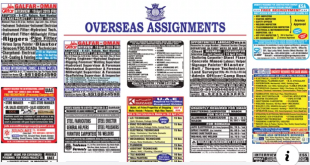 i m gaurang patel i m a graughtsman civil i have 8 yr experience in india consultant office and 2 yr experience in oman. I have 1 year exp in consteaction site as safety officer. & 1 year exp in chemical company as fire man. I like to shut down work & consraction site work. I have 5 years( gulf & India) experience in HSE professional . I searching job. I am finding a job as electronics and Communication engineering, and sql database. if there is any openings please forward It. I AM HVAC PIPING FORMAN .SIX YEARS GULF EXPERIENCE QATAR ABU DABI OMAN . CURRENT JOB IN MUSKAT INTERNATIONAL AIRPORT OMAN .SO YOU HAVE ANY JOB REQAIRED IN INFORM MY MAIL I’D. THANKS. I have 5 years experience in construction safety superviser.. I am diploma in mechanical engg 10 year experiace in qc . My mob no.08128996510. If any qc vacancy is there pls contact me . 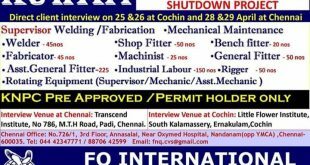 I am looking job for Safety Officer over saudi Arabia aramco company oil and gas camical plant 12years experience with Iosh and theery years diploma . I seeking a job in construction & oil/gas projects for material controller or storekeeper position. I am looking for the position of Electrical Engineer. I have 5 years of experience. If there is any vacancy, Please let me know! I am diploma mechanical tool & die holder 87%. I have 1.5years experience. I’m Mill “Wright Fitter” and 5 years Indian Experience with I.T.I. I am G. Akhil. I completed my graduation in mechanical engineering in 2016.i started working as a mechanical supervisor from 2015 june 5 and continued till date. I have 2yrs experience in pipeline project and road project.now i am looking for a job in gulf. So i request you to please check and inform regarding the same. Looking for any suitable position. I am diploma in civil and 1year experience.I want to go foreign .reletef civil work.so urgently inform me pls. 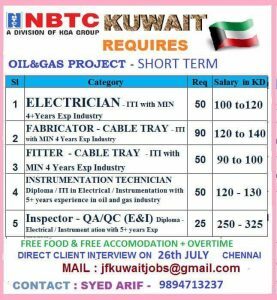 Sir , I am Alok kumar as a pipe fitter my experience 6years in india and I year experience in Kuwait please inform me for right job my contact no 9304094550. I am Sohail Bader, B.Com graduate. I am having 13 years of experience in Administration field including 3 years of GCC experience. I worked in Dubai & Qatar. Objective : To work with organization and team and to archive a sustainable and a positive experience and improvement in performance. At present working in in Pride India Builders, (Real Estate), Hyderabad – 34, Telangana , India. as a “Front Office Executive” from 1st Feb-2013 to till date. Language :	Fluent in English , Hindi, Urdu. 1)	Advanced Diploma in Construction Safety with First Class (69%) from Gemstech International Institute ( Hyderabad, Andhra Pradesh). 2)	(IOSH) Institute of Occupational Safety & Health, Certificate in Construction Safety, UK, from Gemstech International Institute ( Hyderabad, Andhra Pradesh). •	Site Administrator / Sr.Time Keeper in Al Khayyat Contracting& TradingCo. &UrbaCon General Contracting Company for the Project Construction of Palace for H.H.SheikhHamad ruler of Qatar from 10thOct-2011 to 26th Jan-2013. 	Maintaining the Attendance of the Staff & Labors working for the Project . 	Making Transfer Letters for employees. 	Entering the working hours as per the Company format. 	Daily sending the manpower report to the Head Office. 	Preparing monthly Time Cards & sending to the Payroll Department. 	Sending the approved monthly Wages Time Sheet to the Payroll Department. 	Following the Leave Applications & Medical Certificate and sending it to the Head Office. 	Arranging the transport of the Site. 	Following up the emails & sending the necessary documents to Head Department. 	Preparing all officially letters & internal memo’s. 	Maintain close supervision on the daily functions of the staff. 	Handle matters that are directly related to the leave privileges. 	Perform a series of secretarial functions for the committee & provide additional services depending on the individual policies of the institutions. 	Serve as the receiver of important mail, documents & ordered items delivered to the organization’s address. 	To make daily reports & letters of the company. 	Receiving the files & report to the Manager. 	Generating reports on Adhoc & Weekly Basis. 	Preparing minutes of meeting & making the arrangements for important meetings. 	Reporting to the main branch (Abu Dhabi) with regards to regular updates at Site Office. 	Receiving the telephonic calls. 	Controlling the records and files and documentation audits, making sure that all documents follow company policy guidelines and archiving files and records correctly. 	Maintaining documentation for projects under taken by contracting division making in use the project numbering system for easy traceability and proper filing. 	Responsible for receiving, circulating and recording all incoming and outgoing faxes, emails and hand deliveries. 	Maintains a list of who is supposed to receive what sort of documentation and enables the distribution of the correct documents to the appropriately specified recipients. 	Assist in maintaining schedule for creating databases for tracking all technical and non- technical documents and provide status update on a regular basis. 	Receiving technical drawings from various section engineers and ensure revision accuracy before issuing to the client / vender & any third party. 	Prepare all the project document control related procedures during the entire duration of a project and assist in setting up the document control system for head office/ site and engineering support centers. 	Issuing regular reports to the client on Drawings status, Technical Query status and exception reporting. 	Issuing regular reports to project, engineering and construction team on overdue documents from client, vendor and also issue statistical vendor document status purchase order wise. 	Distributing internally copy of transmittals within the project team and site as per distribution matrix assigned. 	Receiving reviewed documents from client and make respective log entries and assign the approval codes for the commented drawings in TDR (Technical Document Register). Also transfer these approvals internally as per the project distribution matrix. 	Generation of Leads & closing the Leads in to customers. 	Consistently achieved a monthly target. 	Was leading a team of 5 within a year of joining. 	Apart from achieving my target was consistently achieving team target also. 	Meeting customers daily tracking them till the customer does not turn potential. 	Giving the product knowledge to the consumer/customer. 	Capable to deal with the customer with self confidence. 	Self motivated, hardworking & dedicated to job. 	Managing the official work. 	Co-ordinate with supervisor for implementation of necessary requirements. I am Abbas, I am BE Mechanical Graduate with 5 years experience in Planning/Scheduling Currently working with Doosan Power for 2X660MW Power Project in India.